Tagged with higher education, OECD, STEM, tertiary. 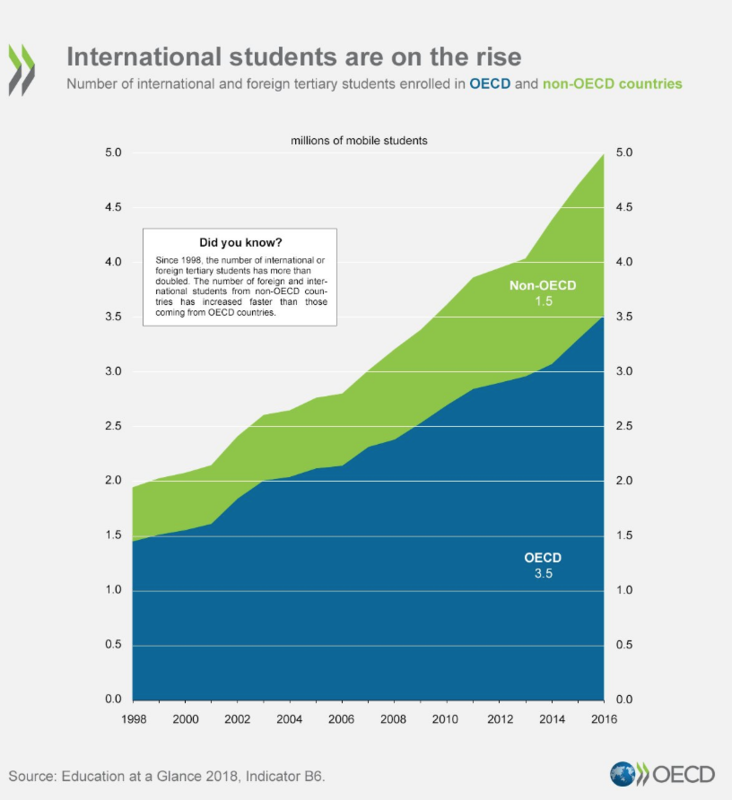 The number of international students in higher education programs worldwide has more than doubled in less than two decades – rising from two million in 1998 to five million in 2016 – with a strong focus on STEM and doctoral programs, according to OECD’s latest Education at a Glance report. The 2018 edition, which examines education systems across 35 OECD countries and various partner countries, found that advanced degrees continue to attract more international students than bachelor’s or equivalent degrees. It found that while international students accounted for only 6% of total enrolment in tertiary education in 2016, they represented more than a quarter (26%) of enrolment in doctoral programs in OECD counties. International enrolment was also significant at master’s level (17%) where on average across the OECD there is more than one international student for every 10 students at this level. However international enrolment in bachelor’s programs was shown to remain relatively low (below 5%) in many countries, with exceptions including Austria, Luxembourg and New Zealand where more than 15% of students at bachelor’s level are international. The report suggested several factors that could account for these trends, including capacity constraints in the student’s countries of origin at advanced levels of education, the availability of narrow specialisations in host countries or post-migration programs. Meanwhile, for host countries, it read, there are strong incentives to invest in later stages of education “because graduates at that level make a large contribution to R&D and innovation, and to addressing socio-economic challenges”. “There has been a huge increase in internationalisation due to more people having access [to education] and high enough income to have their children studying in other countries, and that trend is, pretty much, unabated,” explained Andreas Schleicher, director for education and skills at OECD in a webinar. In terms of contributing countries, he said students from Asia were found to be more internationally mobile at short-cycle tertiary and master’s levels, while European students tend to be more mobile at bachelor’s and doctoral level. According to the report, students from Asia formed the largest group of international students enrolled in OECD tertiary programs at all levels (55%) in 2016, with two-thirds converging towards Australia (15%), the UK (11%) and the US (38%). While incoming student mobility has increased for almost all OECD and partner destination countries, and has almost doubled between 2013 and 2016 in Estonia, Latvia and Poland, outward mobility is more varied. The number of students leaving their country for study purposes increased noticeably in Hungary, India, Italy, Spain and Saudi Arabia, in particular. In terms of destinations, English-speaking countries were found to be the most attractive, with the US, UK, Australia and Canada receiving over half of the mobile students. However, France and Germany were also shown to be major host destinations, which the report put down to a variety of domestic and external factors and initiatives including tertiary-education programs taught in English. These have resulted in Germany surpassing its goal of hosting 350,000 international students three years early and France being named the most popular destination after Canada. Russia was also found to be a major destination country, with 250,000 students enrolled from abroad in 2016.
International students were shown to favour fields in science, technology, engineering and mathematics, with one-third of them enrolled in STEM fields in 2016.
International students also represented at least 9% of tertiary enrolment in natural sciences, mathematics and statistics, and ICT, and 7% in engineering, manufacturing and construction. “The lower language proficiency required to perform in STEM could partly explain the internationalisation of these fields of study,” the report noted. But the central role played by science, engineering and business management, and the career opportunities associated with graduating in these disciplines may be of greater importance, the report continued. However, it warned that there is a risk of squeezing out domestic students from institutions that differentiate tuition fees by student origin, as they may tend to give preference to international students who generate higher revenues. It explained that as part of their internationalisation strategy, more institutions are creating offshore satellite campuses, dual degrees, changing admission rules, teaching in foreign languages and offering online courses and international internships. “And as a consequence, the international activities of tertiary educational institutions have not only expanded in volume and scope, but also in complexity,” it concluded.